The Nokia X Android smartphone is gaining more momentum every day, and we've now got another set of specs to attach to the handset. Perennial mobile leaker @evleaks is at the centre of things again, posting up specs supposed linked to the Finnish firm's much rumoured Normandy device. The tweet reads: "Nokia X: 2 x 1GHz Snapdragon, 4" WVGA, 512MB / 4GB / microSD, 5MP, 1500MAh, Nokia Store + 3rd party, dual-SIM, 6 colors" - which falls in line with specs leaked earlier in the week. 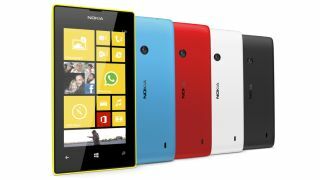 These are similar specs to the current baby of the Lumia range, the Nokia Lumia 520, although the Nokia X looks set to pack less internal storage and a slightly larger battery. The biggest difference however will be the operating system, with Nokia ditching Windows Phone 8 in favour of a potentially heavily modified Android platform. Of course these specs can't be taken as gospel, but @evleaks does have a pretty strong track record of being on the money - so watch this space. What else do we know about the Nokia X?